NASA's next Mars rover should hunt for signs of past Red Planet life and collect samples for eventual return to Earth, a team of mission planners has determined. The new Mars rover — slated to launch in 2020 — should explore a site that once was habitable, make its own observations and snag material for scientists here on Earth to study in unprecedented detail at some point in the future, according to a new report compiled by the mission's "science definition team" (SDT). The 2020 Mars rover will be based heavily on NASA's Curiosity rover, which touched down last August on a mission to determine if Mars could ever have supported microbial life. For example, the new robot will use a similar chassis and "sky crane" landing system, NASA officials have said. But the 2020 rover will take the science to a whole new level. 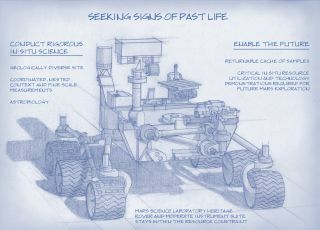 "The 2020 rover as proposed by the Science Definition Team would carry a different and more advanced set of science instruments than Curiosity carries, its drill would extract cores rather than blended powder from rocks and it would collect and package samples for possible future return to Earth," NASA officials wrote today in an FAQ about the SDT's report. Just what those instruments will be is unclear at the moment; they will be selected through a competitive process. But the science gear will search for visual, mineralogical and chemical signs of past life if the SDT recommendations are adopted. "The capability for examining the mineralogic composition of samples at microscopic scale would be unprecedented for a mission to Mars," NASA officials wrote in the FAQ. "The search for potential signs of past life could use assessments of textures, shapes, mineralogy, organic-matter content, and possibly elemental chemistry at the scale of individual grains within a sample." The rover would also gather and store samples for potential return to Earth by a future mission (the timing and details of which are yet to be determined). Sample-return is viewed by most scientists as the best way to look for signs of Red Planet life. The new rover's landing site has not been selected yet, officials said, and its power source similarly has not been confirmed. Curiosity is powered by a radioisotope thermoelectric generator (RTG), which converts the heat generated by radioactive decay into electricity. The 2020 rover may follow suit, but it's also possible that it could run on solar power, like NASA's smaller Spirit and Opportunity rovers, which landed on Mars in 2004. "No final decision on a power source for the 2020 rover would be made until the mission completes a review through the National Environmental Policy Act process, which considers the environmental impacts of launching and conducting the mission," NASA officials wrote in the FAQ. Curiosity's mission cost a total of $2.5 billion. The 2020 rover is expected to be significantly cheaper, with a total price tag estimated at around $1.5 billion. The new 2020 rover mission was announced this past December, and the SDT was formed in January.